Suits are required for many occasions, and if the invitation to an event says that a suit is required it is fair to say the occasion will be an important. On one, the most popular forms of suit hire are for evening wear. This kind of dress is used for celebrations such as black and white-tie events, formal dinners, balls, banquets, school proms and on cruise ships at evening ballroom events. There are different choices of evening wear available; most people opt to wear a black outfit; however, for those after a different look and a something to stand out from the crowd. White suit hire could just be the perfect option. What is a white suit? Unlike an Edwardian or tailcoat suit, white suit hire is not one particular kind of suit; this means there will be a number of options available to you. One popular choice is the lounge suit. This kind of suit is probably the most popular of all western-style suits and can fit in perfectly at any sort of occasion. The suit consists of a single or double-breasted jacket with matching trousers. Although the trousers are not open to variation, the jacket most certainly is. Each lounge jacket will come with a choice of lapels, including notched, peaked and shawl and number of buttons with one, two, three and four available. If you are looking to impress at an occasion whilst playing it safe, a lounge suit will be the ideal choice. 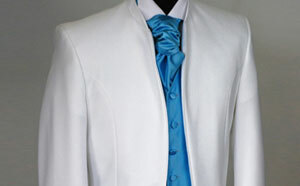 Another option and probably the most popular among white suit hire is the tuxedo. This outfit is the perfect suit for any evening event and mixes stylish and classic brilliantly. The white tuxedo will consist of a one-button evening jacket with matching formal trousers. It will generally be worn with a wing or standard collar white shirt and a touch of colour will be added with a stylish bow-tie or tie and waistcoat or cummerbund. The price of the package may differ on whether you opt for a waistcoat or cummerbund with the former being the most expensive. White suit hire can be done in a number of ways. As the customer you will have the option of hiring from a shop, an online retailer or a mobile hire service. Hiring from a shop is the most popular and will allow you to see suits first hand. Online hire will be the best option for convenience while a mobile service offers the best of both with the fitting and choice made at your home, although the choice of suit may be limited.